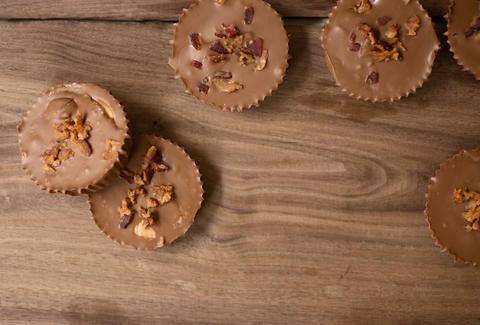 There are very few things in life better than bacon and chocolate. And since you can't actually eat the theme song to Teenage Mutant Ninja Turtles, I opted to combine the two next best things into a savory-sweet dynamo. And while the duo does make a formidable marriage, the two strong flavors need a buffer. 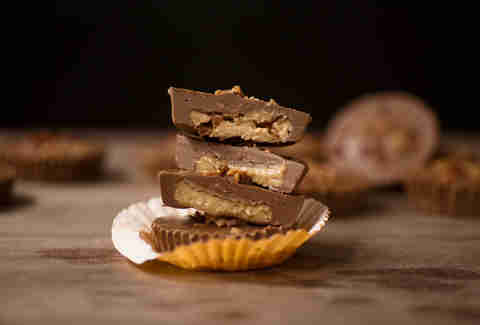 Rich, creamy peanut butter mellows out the smokiness of the bacon and offsets the sweetness of the chocolate. It's so good, we almost enjoyed them as much as Michelangelo loved that sausage and jelly bean pizza. ALMOST. Place bacon strips on a baking sheet and bake until crispy, about 15 minutes. Transfer to a paper-towel-lined plate. Fill a medium pot with 1 inch of water and bring to a boil. Put chocolate chips in a medium heat-safe bowl and place it over the pot. The bottom of the bowl shouldn’t touch the water. Stir chocolate with a spatula until melted and smooth. Remove bowl from pot and spoon 1 tablespoon of chocolate into each muffin liner; swirl to coat the bottoms. Return the pot of water to a boil. Combine peanut butter, powdered sugar, butter, and vanilla in a medium heat-safe bowl and place over the pot. Stir until melted and smooth. Let cool slightly and transfer to a Ziploc bag. Cut a tiny bit of a corner off and pipe a quarter-size dollop of peanut butter mixture into the center of each muffin liner. Break bacon slices into 1 1/2-inch pieces. 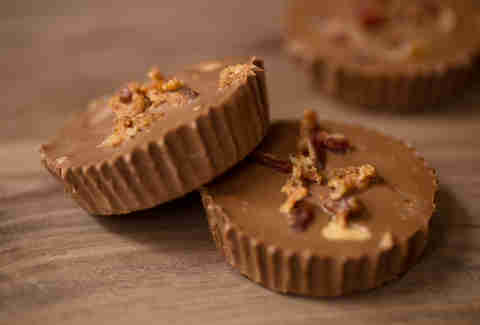 Place a piece of bacon over each peanut butter dollop and press down gently to level. Crumble the rest of the bacon and set aside. Re-melt the chocolate if necessary. Spoon 1 tablespoon of chocolate over the bacon to fully cover it. Pick up the muffin tin in both hands and gently tap it against the counter to level the chocolate and dislodge any air bubbles. Sprinkle bacon crumbles on top and place tin in the refrigerator to fully set, about 30 minutes. Let sit at room temperature for 10 minutes before eating. They’ll keep in the fridge for up to a week.